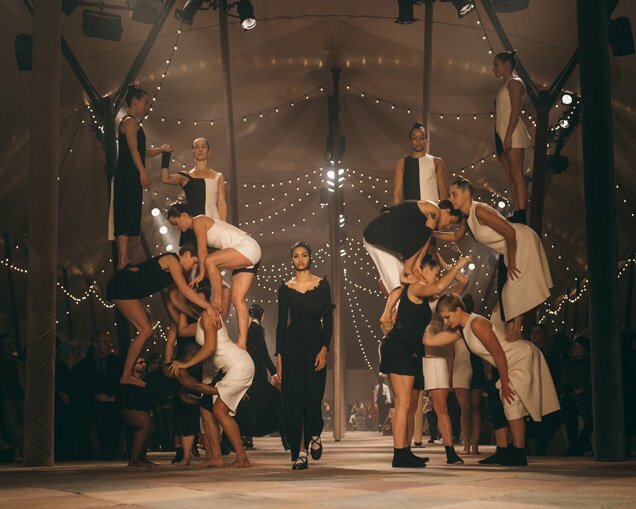 We caught up with visionary circus co-artistic director Lina Johansson fresh from her company Mimbre’s sensational performance as part of the Dior Paris Fashion show. All Dior fashion show images are by Ines Manai. Tell us about Mimbre. How did the company come about and what makes you different in the world of circus? After my training in London at what’s now the National Centre for Circus Arts, I started working with Emma Norin and Silvia Fratelli and we went together to a circus school in Cuba to learn more. Back then, the circus scene was dominated by big men lifting small women, but strong women have always existed in traditional circus. 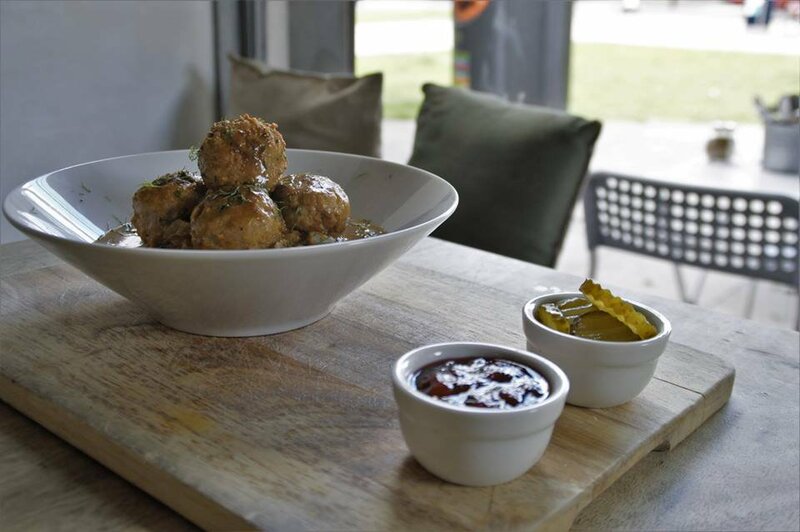 We didn’t want to just be the ones who were thrown about so when we returned to the UK we decided to set up our own company. Mimbre (‘mim-bruh’) is Spanish for wicker and also an acrobatic move where two performers create a platform with their hands and throw a third into the air. It describes our style of choreography perfectly – weaving bodies together to connect movements and tricks – and it also embodies the idea of combining the individual strengths of our performers into something beautiful and supportive. At Mimbre I am very lucky to work with a pool of some of the finest circus and physical performers, all passionate about placing their skills into different visual and theatrical contexts. We try to use circus and dance as a physical language to illuminate human connections and promote a positive image of women. We also try to reach far and wide with our shows, and not limit ourselves to theatre stages, but instead create unexpected moments in unusual spaces; be it placing them on a street, a square, a circus tent, a garden, an old house or on a fashion runway! We’ve seen the astounding images from your Dior collaboration. How did the project come about and what were the challenges working in a high fashion environment? 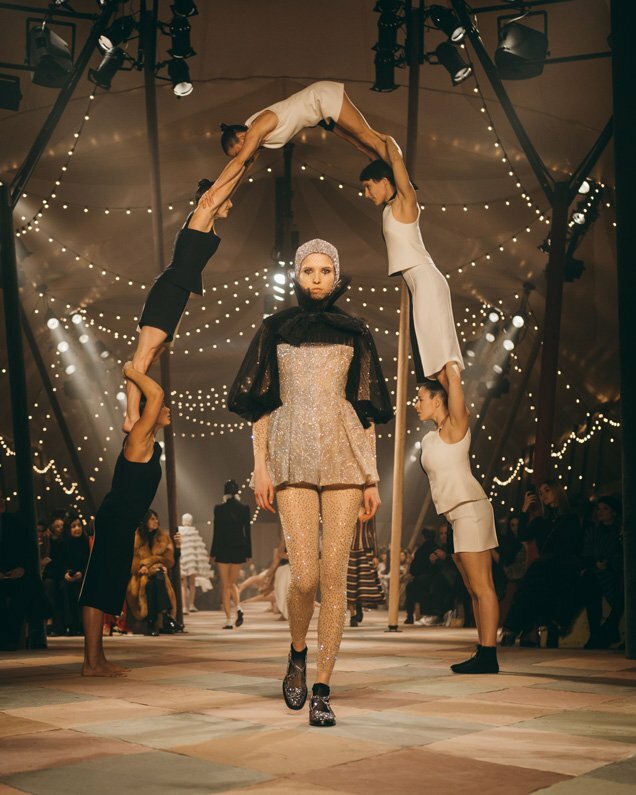 Maria Grazia Chiuri – Creative Director of Dior, was using circus as inspiration for her new Haute Couture Collection and had come across our company. She was inspired by the image of female strength that we deliver with our performances, and so she invited us to collaborate to make a performance for the actual show of the collection, as part of Paris Fashion Week. Both me and Maria Grazia work with images and form as starting points and the moodboard she showed me for her collection immediately sparked choreographic ideas for me. The first challenge I think was that you already had an amazingly beautiful space and a spectacular collection of Haute Couture looks. Then you’re adding circus – which is so visual. How do I make sure it’s a choreography that really merges with and compliments the collection and the world, without it all becoming a sensory overload? Working closely with Shona Heath and the designers from Bureau Betak, as well as creating several storyboards to show and discuss with Maria Grazia, made that a really enjoyable challenge though, and I hope was a feat we achieved! The creative environment was a pleasant surprise to me. Despite the high pressure and the tight time frame, I felt creatively stimulated and enormously supported. Everyone was incredibly good to work with: efficient, direct and respectful of our work. The Haute Couture world is full of people who are so passionate about what they do, so skilled, so excellent at their craft and I love working with passionate people. Everyone really just worked together towards everyone doing their best. What do you think collaborations and imagery like this do for female empowerment? I do think it makes a difference. The physical imagery of the acrobats is so strong; it is so symbolic. It was reviewed across the world and nearly everyone mentioned the female strength, the mix of bodies and the statement that Maria Grazia made about female empowerment through this collaboration. In times of division and strife, I am also immensely proud of having created something so beautiful through a collaboration between so many nationalities. I had a dream team of acrobats and collaborators – Italian, Swedish, French, Portuguese, English, Scottish, Canadian, American, Hungarian…. Creating instead of dividing, and building towers to the sky which I hope will inspire others to always aim high and to work together instead of against. And for me, if just one young girl watches this show and aspires to become a strong acrobat,then that matters to me. Or if just one woman watches this show and sees a different aspect of womanhood represented, where she can see herself more reflected – then that has expanded the possibilities of what women can do in the public eye, how we are represented in the media and acceptance of what women are. What or who are your influences for making circus works? I must say I take inspiration far and wide, a lot of it through photographic work, through drawings, painting or images. But something less obvious, like a visit to the Science Museum with my daughter, can also set me off. For the Dream Parade for Dior I actually used a video of ferrofluid from their excellent Wonderlab, as a reference for the way I wanted the acrobats’ bodies to relate to each other. Last year’s 250th anniversary of circus, Circus250, also greatly inspired me to refresh myself on the history of circus, and for me it’s not about traditional vs contemporary or old vs new, it’s all connected and all builds on a great tradition that is constantly changing: innovative, experimental and inspiring. I have two daughters and love taking them to all of the fantastic free London museums, parks, ice-skating rinks in the winter or lidos in the summer. When at work, I head to Curious Yellow Kafe for my morning coffee and a chat, and to celebrate the end of an intensive project I love The Parlour for a big breakfast. London International Mime Festival (taking place at the moment) is a bright spot in the winter for inspiring circus and physical theatre performances, Jackson’s Lane for circus throughout the year, and over the summer the Greenwich + Docklands International Festival provides a brilliant programme of inspiring outdoor theatre. And finally, of course, Mimbre’s home at the National Centre for Circus Arts and honestly, our Youth Programme in Hackney feels like a second home for me too – coming back from the stars and the glamour, the joy in teaching those enthusiastic kids is still so rejuvenating! 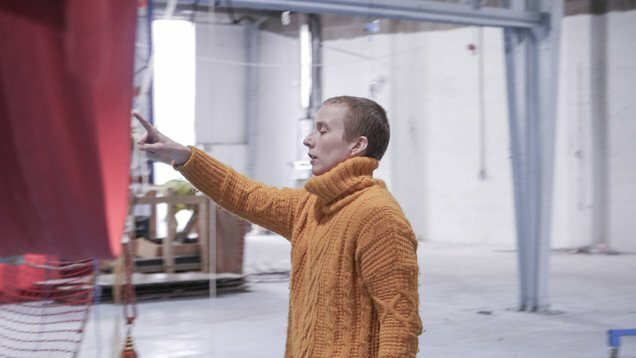 Mimbre’s new show Lifted will tour throughout summer 2019.